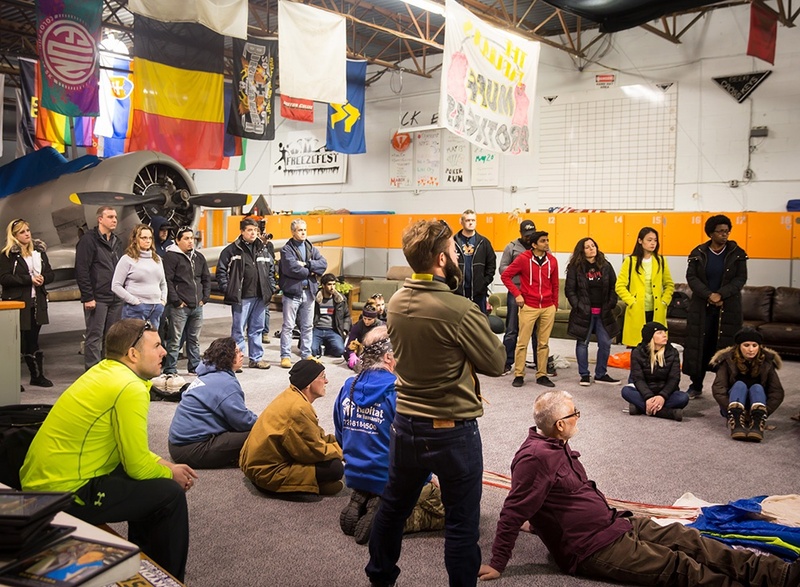 At Skydive Cross Keys, the culture of safety is one of our core values. That’s why the annual Safety Day is one of the most important events of the year. This year, despite the unjumpable winds and chilly 30-degree weather, we were very happy to see so many people attend Safety Day for the safety seminars and refreshers. Williamstown Fire Department traditionally opened the event by doing a demonstration of their harnesses and tools used to pick ripe skydivers off the trees. Luckily, we haven’t had tree landings requiring their help in a long time, but the presentation is always very appreciated and useful in knowing how to cooperate with the rescue squad. The seminars continued with Range talking about "Fallschirmsprungkamerasicherheit", or Camera Flying Safety. Here’s a great video by Norman Kent that everyone who jumps with a camera should watch: Dangers of Being a Hero. Read the SIM on camera safety before your first camera jump (or 100th, we won’t judge). After a quick break and a snack at our favorite food truck Fed By Ed, we had an impromptu class on Downsizing Safety, taught by Brad Moon. Brad talked about the dangers of poor canopy choices, and everything you should be able to do with your current canopy before you consider downsizing. For smaller people (not only girls), there’s a great video made by PD: Girls can’t fly parachutes. It talks about proper downsizing strategy for people who start off with very small wing loading on student canopies. If you are not sure whether you’re ready to downsize, or want feedback on your canopy flying skills, Brad is always happy to help. Also, Matt Vasapollo will be offering monthly “B” license canopy courses this year, and we’ll have intermediate and advanced level canopy coaches at least twice this season: Greg Windmiller in June and team Alter Ego (Curt & Jeannie Bartholomew) in September. Keep an eye on CK monthly email updates for the dates. The next class was Airplane Safety, presented by Pico. Short summary: Don’t grab flap. Don’t hang out in the tail. Don’t jump through clouds. Don’t eat the damn cabbage on weekends. Don’t jump if green light isn’t on. In case of emergency, listen to the pilot before you do anything. Spot yourself, don’t let the lemming effect take over, and if you really need a go around, don’t be shy to ask for one. 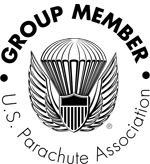 Read the FAR Part 105, the FAA’s regulations on parachute jumping. Be aware that skydivers can be (and have been) fined by FAA for FAR violation. 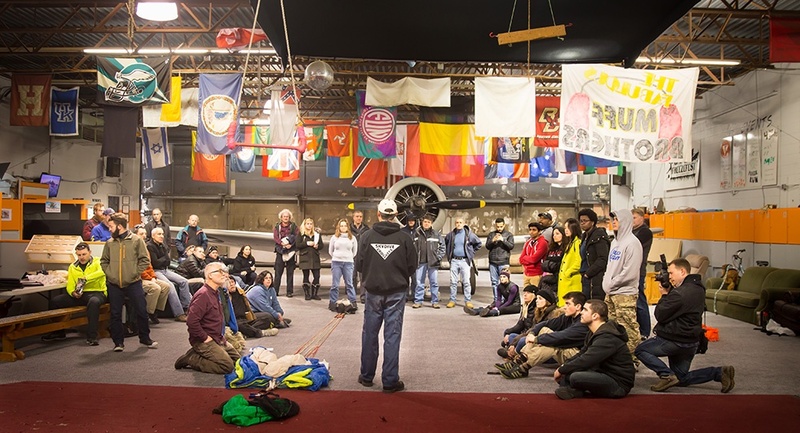 Pancake’s class on Canopy Flying Safety was full of life saving information. We fly a left hand pattern at CK, and if you find yourself having to fly a right hand one, know your (multiple) options to remedy the situation. Know your landing priorities, level wing into a clear area. Landing into the wind makes for softer landings, but landing in the same direction as all the other canopies is the actual priority for safety. You should always be prepared and able to land crosswind or downwind if necessary due to changing conditions. Practice those landings, and any non standard maneuvers, on a hop & pop pass to make sure there’s no one around you. Need a refresher on the alternative landing areas? Don’t be shy and ask any instructor. (If they say that Canal’s parking lot is the best, they’re joking, but you probably need to pay up your beer fines). Brian was next with a Freeflying & Tracking Safety Class. The key points were how to make sure that your gear is freefly friendly, and how to practice your freeflying without putting other jumpers in danger. It is helpful to practice with another person to have a point of reference in freefall. Also, practice your vertical flying across jumprun, not along it, because most new freeflyers backslide without noticing it. Jump with experienced coaches to improve your skills! We’ll have Melanie Curtis available for coaching this season, and she is a great flyer to learn from both in the sky and in the tunnel. Ricky continued with some points about safety of tracking and angle flying jumps. Pancake then talked about Equipment Safety. Whether you rent or own, pack for yourself or hire a qualified, shiny happy nylon engineer, you should always be looking after the rig you’re about to jump. Learn to recognize common wear points like your kill line, toggle stows, closing loop and steering lines. Double check how neatly you’re stowing your lines and how much excess there is in the pack tray. ALWAYS perform a gear check at least three times: before you put on your rig, before you board the plane and before you jump out. To drive the point home, we looked at a rig specially packed with some of the most creative packing and rigging errors imaginable to demonstrate how important it is to examine each and every part of your gear before putting it on your back. From this season on, we will be enforcing gear checks for each other before loading the plane. No one may board without a proper gear check by an instructor or licensed jumper. Please be in the boarding area by the 5-minute call to make sure you’re completely ready to skydive before the plane pulls up. Being there 5 minutes early helps us make our drop zone safer and fly more loads, so you can jump more! Mike Volk was stoically leading the Emergency Procedures refreshers in the classroom. By the end of the day he could probably recite them all by himself too! If you didn’t get a chance to practice your EPs this year, talk to any instructor to help you. Practice EPs until they become second nature, which means, hundreds and hundreds of times. And a closing word from your CK crew. Gear checks in the boarding area are now mandatory. Not necessarily with an instructor; buddy checks are perfectly fine. Being in the boarding area on 5 min call, gear fully on and dirt dive complete, will be strictly enforced by the loader, instructors, and manifest. Don’t be that guy who loses their jump ticket. Matt will be offering “B” license canopy courses once a month, or more if needed. We’ll announce the dates very soon! EP training for licensed jumpers will be offered weekly for free, you’ll just need to sign up in advance, and visit Canal’s beforehand. Times will be announced soon. Refresher courses will be mandatory for everyone found doing stupid stuff not abiding by CK safety policies, sport regulations and common sense practices. Be safe and enjoy the new season!